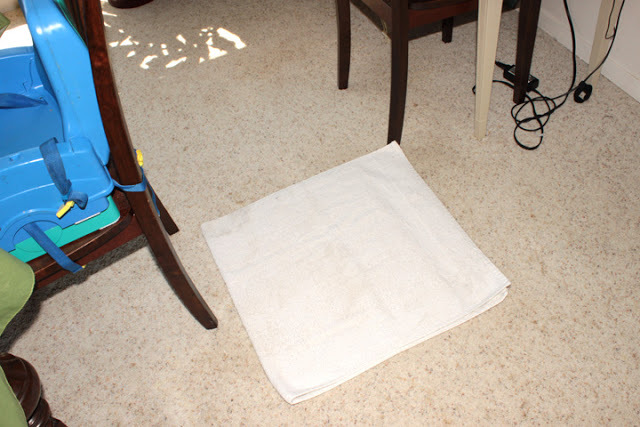 This post is dedicated to our mother, the cleaning queen. As long as we can remember, our Mom has always had some crazy cleaning tips that work like magic! To this day, we still bring over our laundry to have her get a spot out or ask her for tips on those hard to clean items. She always has a recommendation that works 99% of the time. 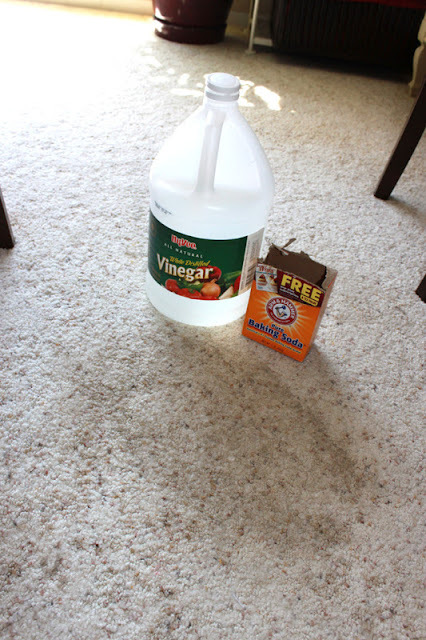 We thought it would be nice to share some of her genius cleaning tips periodically. Thanks Mom for all you have done for us over the years! Back in April, I was working one morning and my son was playing so quietly beside me. Yep, that is maple syrup he is drinking out of the jug and that lovely maple syrup stain has been on my carpet forever! 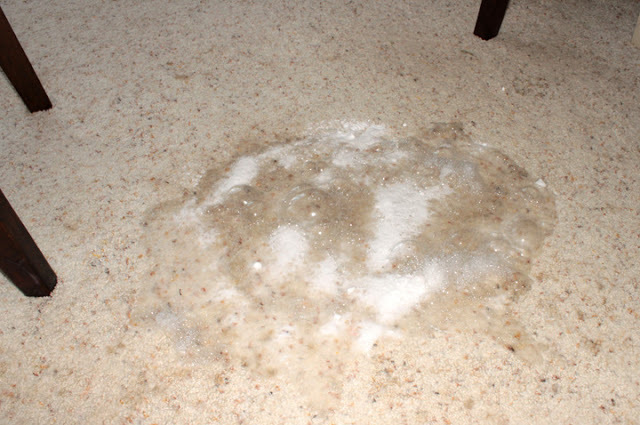 I have tried to scrub it out with various carpet cleaning chemicals, but it just has stayed there. It’s a little lighter than the original, but still there. One day I was complaining to my Mom about how bad our carpet looks and that I can’t seem to get this stain out and another (where I spilled an entire cup of coffee.) She told me to try vinegar and baking soda. I thought, “What the heck!” At least we will have fun watching the chemicals react. So I sprinkled some baking soda on the stain. And poured some vinegar over the top. 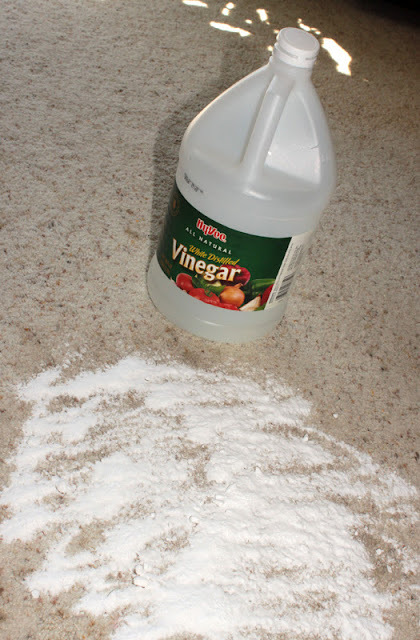 After letting it dry, vacuum up the remaining baking soda. And the stain is MAGICALLY gone!! The only bad part is now I have a white spot on the carpet where I cleaned it! 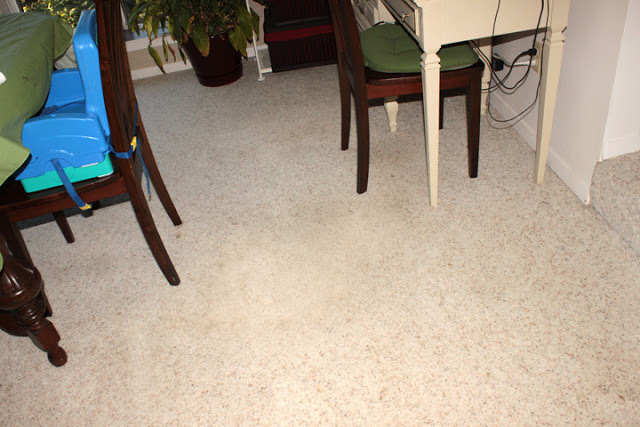 It just shows you how bad these carpets need to be professionally cleaned. I am sure we will track on it enough to blend in with the rest soon enough! 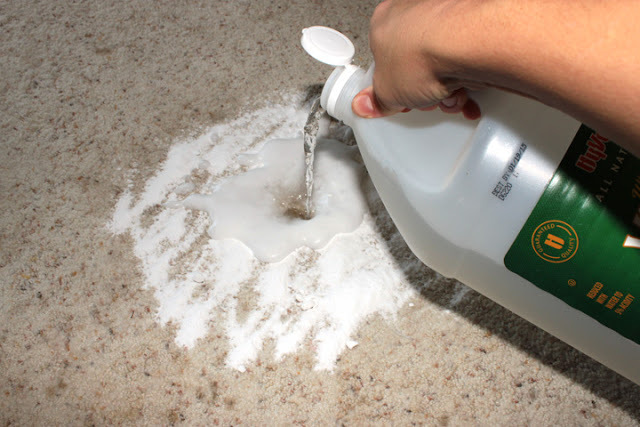 Also, not sure if this will work on colored carpet, so I am just giving you a warning to maybe stick with white carpet only. 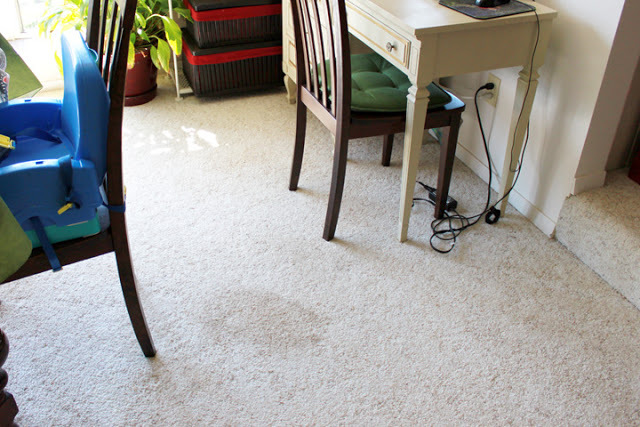 Do you have any awesome cleaning tips you would like to share? If so, comment below. 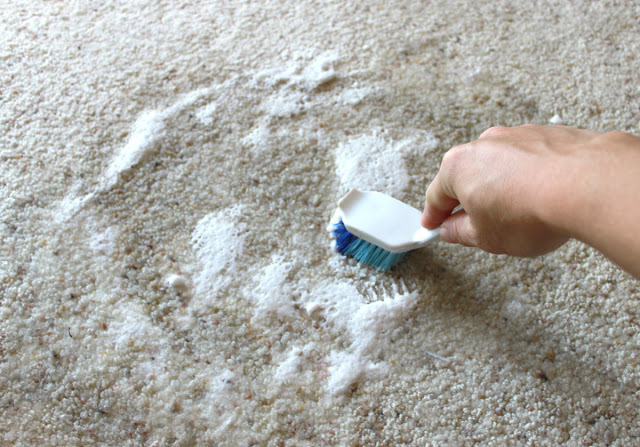 We would love to hear any ideas to make cleaning easier! Of course this picture was before kids and we have moved since then. Our new house (which it is anything but new, try 1970s house) has a horrible layout. I have no place for toy storage, so the living room had to be sacrificed to be both the living room and the toy room. There goes my dream of the perfect living room! I decided a few months ago that rather than to fight this battle, I would try to combat it by providing some sort of storage option for the toys. 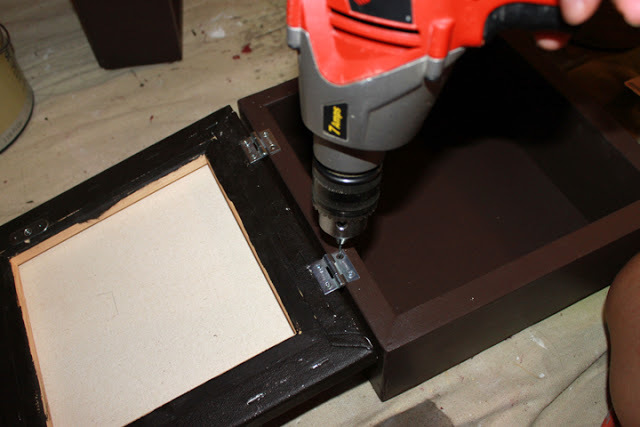 Months ago I built this handy little open toy box and it has been a lifesaver! Unfortunately, due to a few awesome deals of Little People and Legos, we are running out of room in the toy box already. However, I haven’t had the time or the energy (4 weeks till Baby 2.0 is here!) 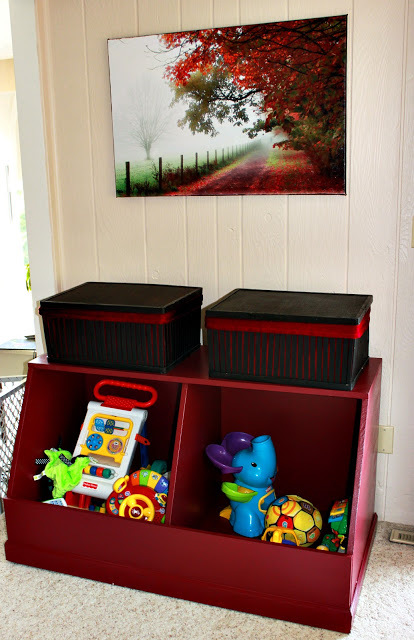 One day I came across an Ikea Trofast storage unit at a garage sale for $5! I had an idea, let’s just throw this on top of the current toy box and use it for the extra storage I was going to build. However, when I got home and put it on top of the unit, it looked a little funny. I think it looks funny because it doesn’t match the width of the toy box and the stair-stepped shelving makes it look strange. So I set off to correct the issues and hopefully end up with something that looks like it’s a one piece unit. 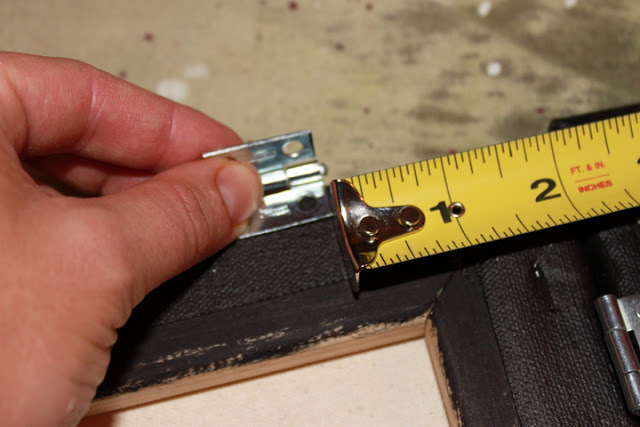 I came across this photo on pinterest and thought it was a great idea to add to the sides to make the width match! Anyways, that is my plan. 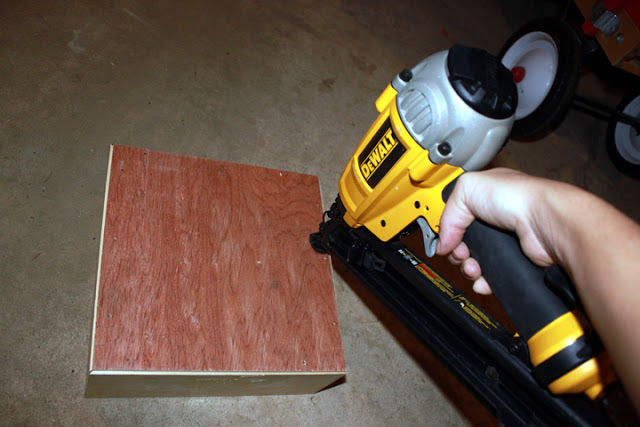 I can’t wait to show you the results, but first I will give a little DIY on how to build these side shelves…that you could add to your own Trofast shelf, dresser, or whatever else you can imagine! 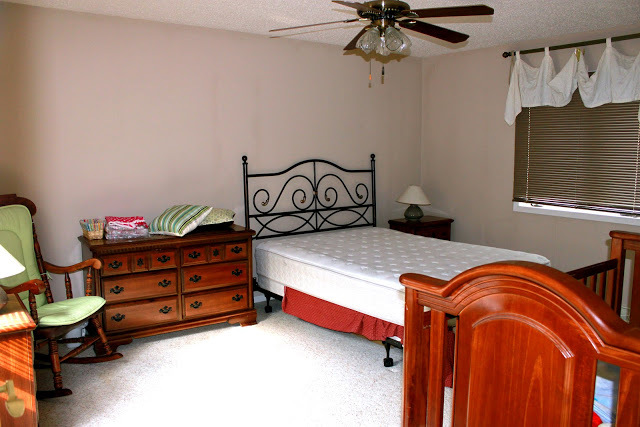 This room is located in the front of our house and our largest bedroom. Like the rest of our house, it was a very dated 1978 room. Complete with the swag window treatments, plastic blinds, and dated ceiling fan. 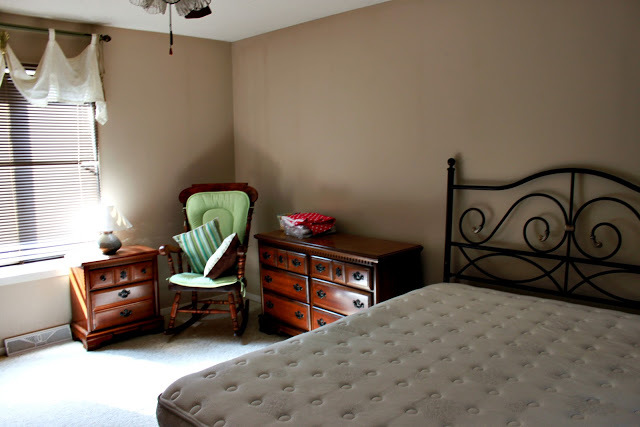 We have used this room as our guest room and basically our overall storage room. 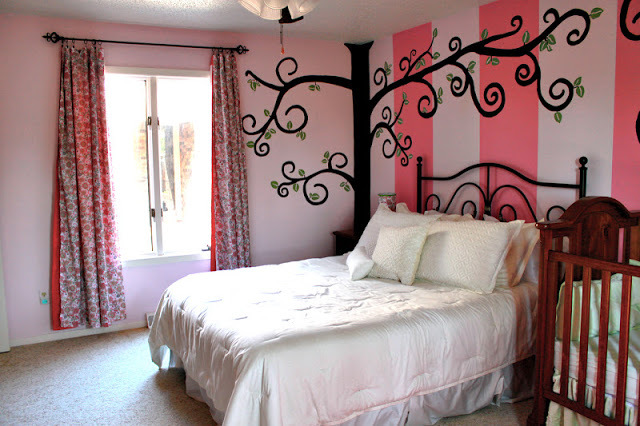 I really wanted to keep a queen bed in the room for me to crash in on those nights when she is having trouble sleeping. I had a bed in the room with Aiden and LOVED it! Also, my husband appreciates the quiet when he is trying to sleep and the less disruption of me getting in and out of bed. I painted wide stripes on one wall to create a little depth to the space and I painted the trees on the wall for some nice contrast to the pink. The trees look black, but they are really brown. The day I took the pictures it was just really hard to get the lighting right, so sorry the trees look black. A view of the other side of the room. 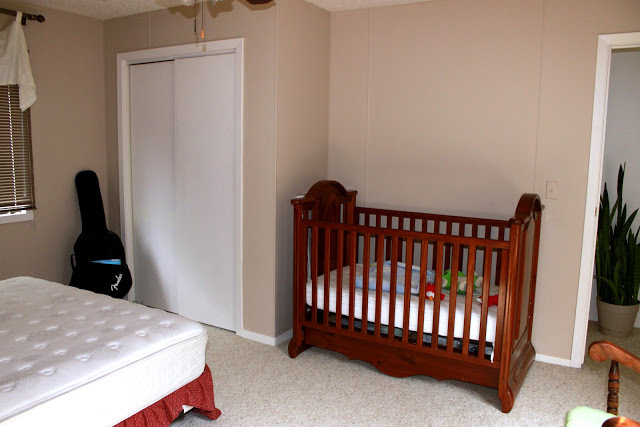 A closer look at the crib, rocker and other side of the room. You can see half a clock, which was a clearance hobby lobby find for $5! Also, you can see the super cute and easy lamp shades I recovered. The rug was also found on clearance at Kmart, but can’t remember the price. I think $13 or something like that. Here is the room looking at the front door of the room. This is a better view of the fan, which I would have loved to switch out! Here is the after. 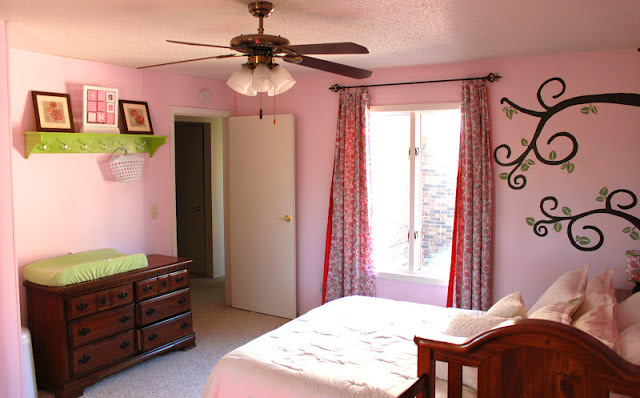 I really wanted to change out the fan in this room to a chandelier of some sort, but I made my husband a promise that anything done to this house would be paint only since we plan on building a new one in a few years. I did, however, update the scones to look less dated than the previous tulips. 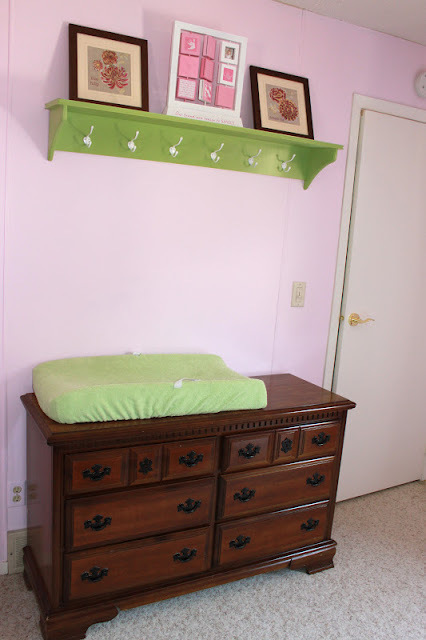 The changing table and dresser area. This is the before view of our closet. 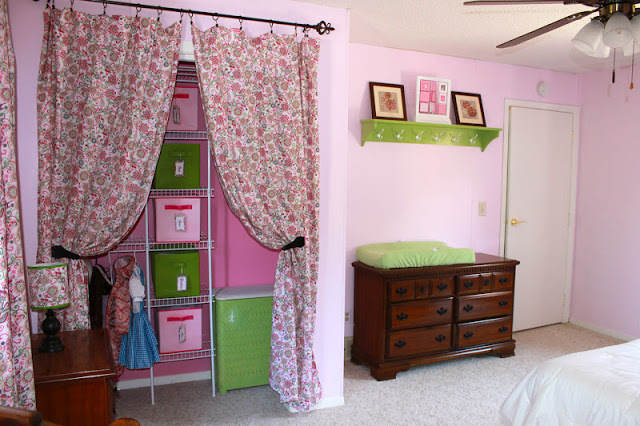 I hated these closet doors! There was no bottom track, so they smash your fingers very easily and slide off their top track which is super annoying to get back on. 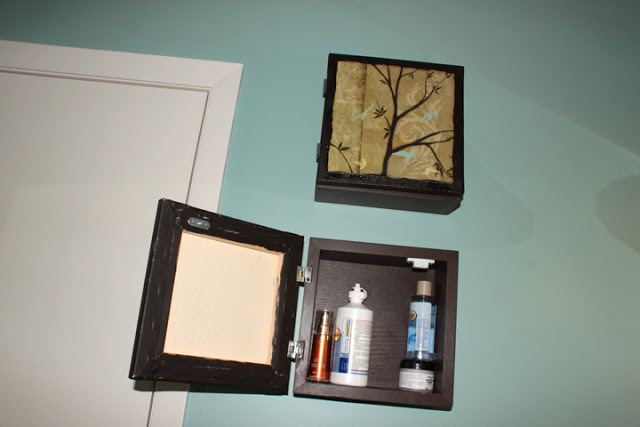 I also installed a closet organizer to help keep the closet looking cleaner. The hamper actually belonged to a relative of my husbands and use to be cream colored. I spray painted it green to add some more green to the room. 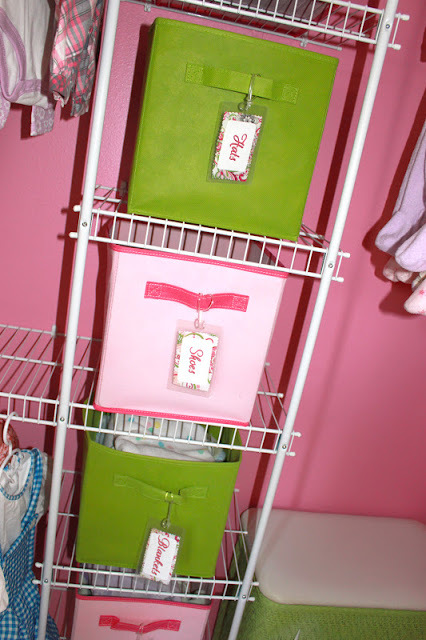 I am obviously in love with my Super Easy Basket Tags. 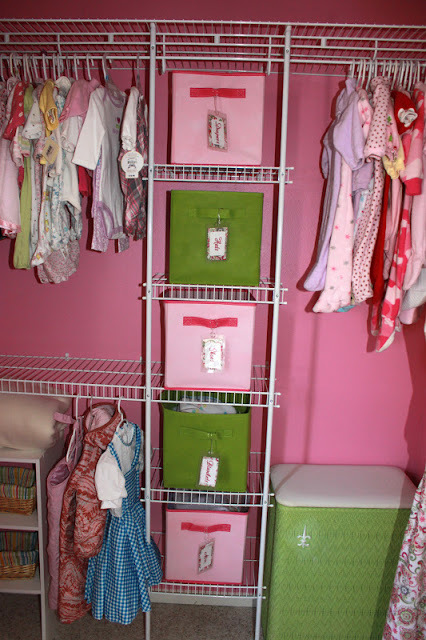 They are just another way to keep the closet organized. If you can’t tell….I have hit quite a few garage sales, so I think she is set on the clothes!!! I am happy to have it finished and really liked the way it turned out! I think at some point in the future I will need to devise some sort of book storage in the room, but I have a few years for that…and maybe might have another house at that point too. We will see…. I am sure many of you have a raised deck, most likely from a walkout basement. 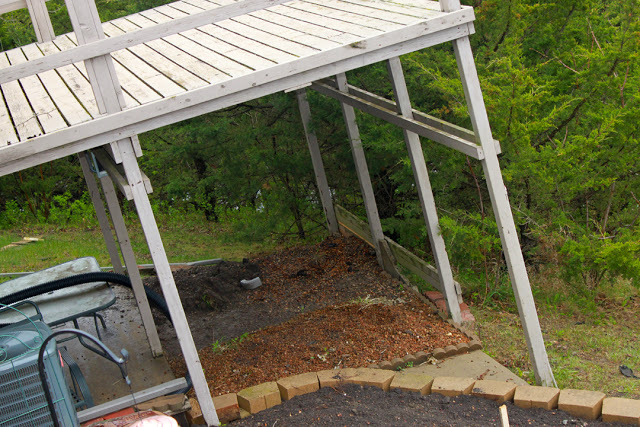 Most people are normal and turn the underside of the deck into some type of great patio or grilling area. However for us, we have two walkouts (one on each side of the house) and this one is down a very inconvenient slope in our yard, so a nice patio area would not get much use. Here is the picture of the area I am talking about. Enough about the deck…the nice feature of this deck is the shade it provides and that the location is right next to the garden area. The previous owner of the house had a hot tub down here, which we don’t plan on buying. 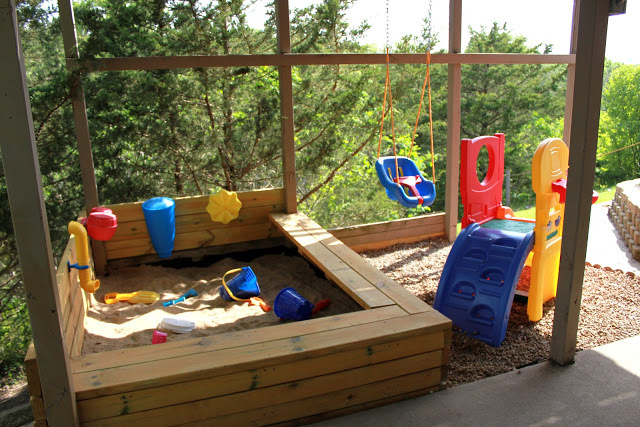 However, after watching my son play around the yard I thought the area would make a great place for a sandbox and playground AND use the deck to provide some shade. 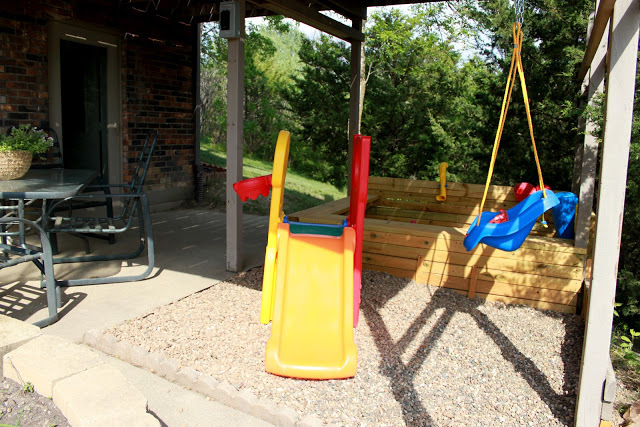 This probably isn’t an idea that most homeowners would be interested in, but I have seen a few other houses around my town where they have installed a swing set under their deck. If you have two decks like us, this might be a good option for you. 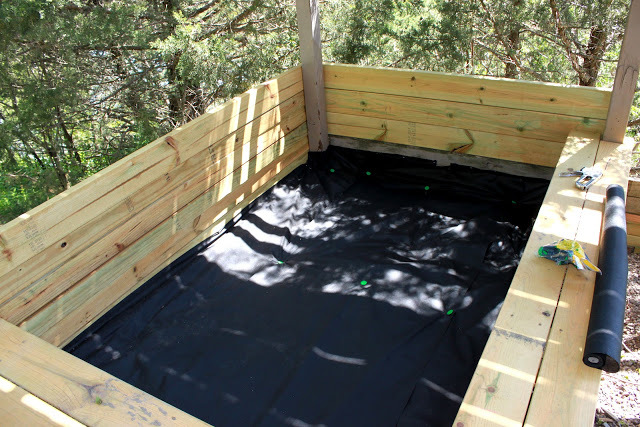 Here is an up close of the area under the deck. 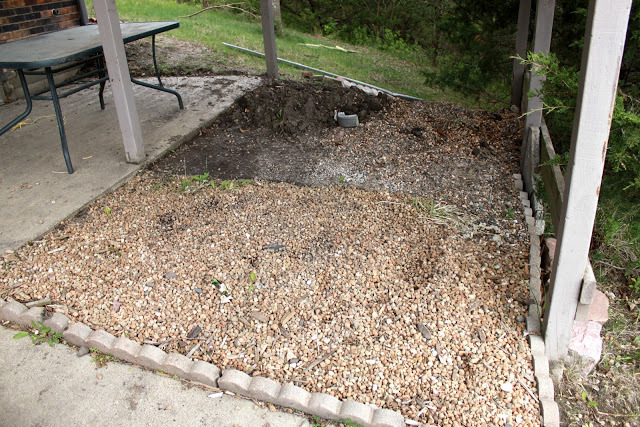 The rock area will stay rock, after removing some hostas, and the dirt area (the old hot tub area) will be where the sand box will go. I decided to make the walls higher on two corners of the sandbox because on one side of the area there is a good drop off. 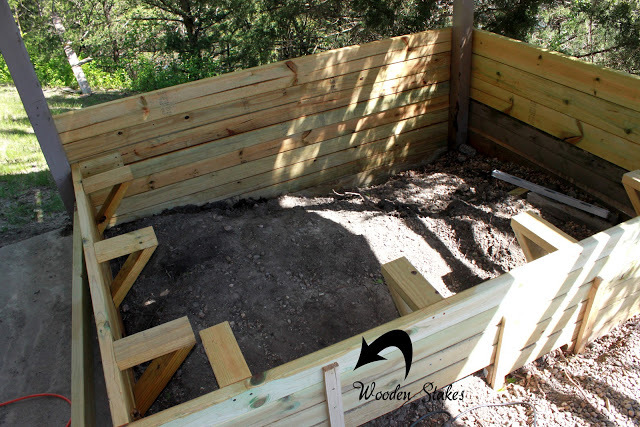 The back and left side of the sandbox will have the higher walls. I don’t want any crazy toddlers (Aiden) jumping out the wrong side and falling down a hill. 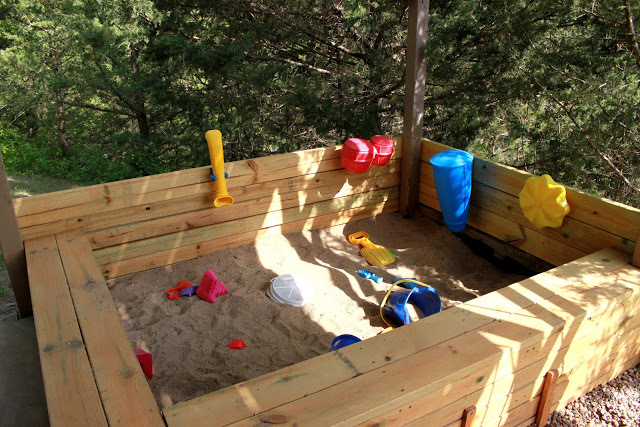 On the other two sides, I wanted some seating for my husband and I if we wanted to play in the sandbox with him. 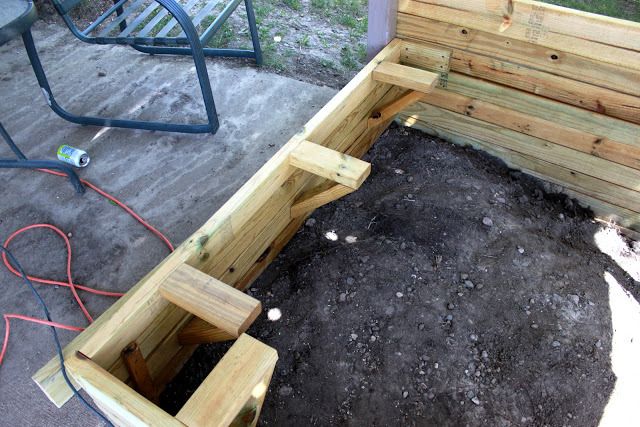 My first task was to build up the sides of the wall on the sandbox. 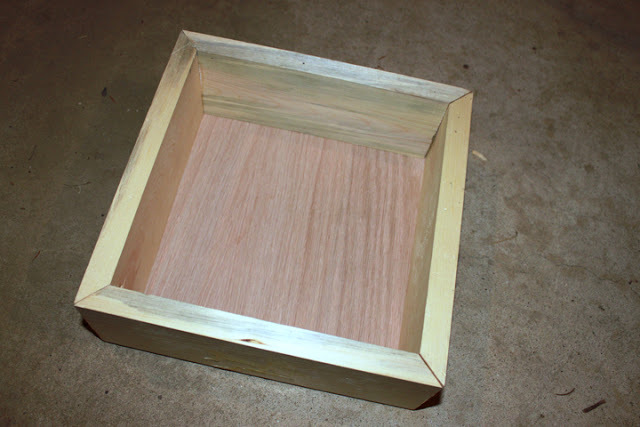 I used the deck supports to attach the sides of the sandbox. 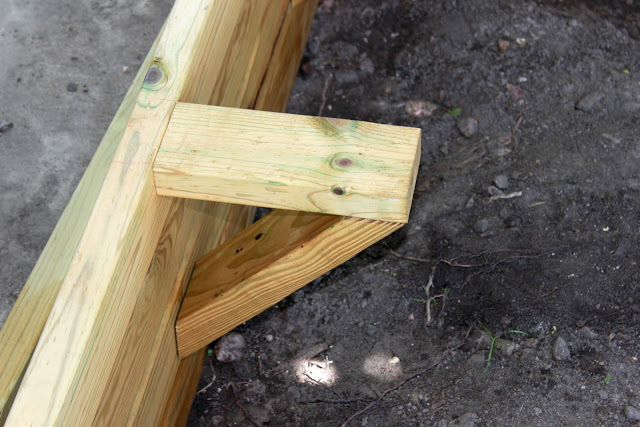 Now some of the deck supports aren’t very close together. To provide support for the walls I hammered wooden stakes into the ground and drilled the sides of the wall to them. For the seat support, I made an angled support and positioned them every few feet, which should be enough to support the average adult. 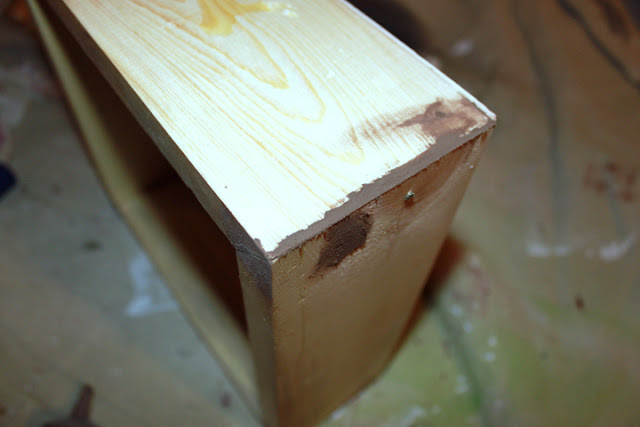 Here’s a close-up of the support if you are wanting to build something like this. You will have to use your math skillz, which I am not ashamed to say my husband helped me out with–he was a math major after all. The embarrassing part is that it uses the very basic algebra equation…if I can’t remember algebra I wonder how bad my calculus is! To find the length of the angled board, we just used the pythagorean theorem . 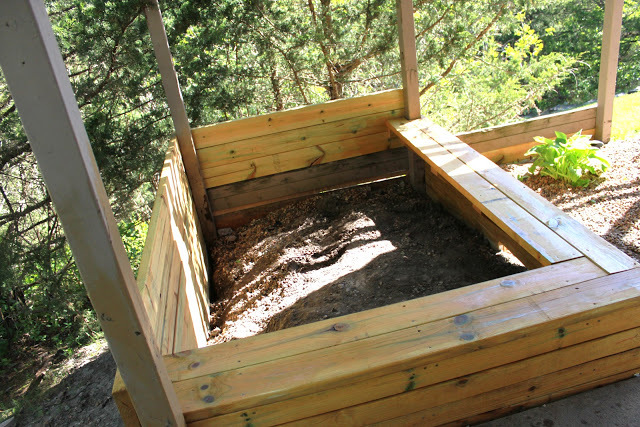 Here is the completed sandbox with the seat for sitting on the two sides. 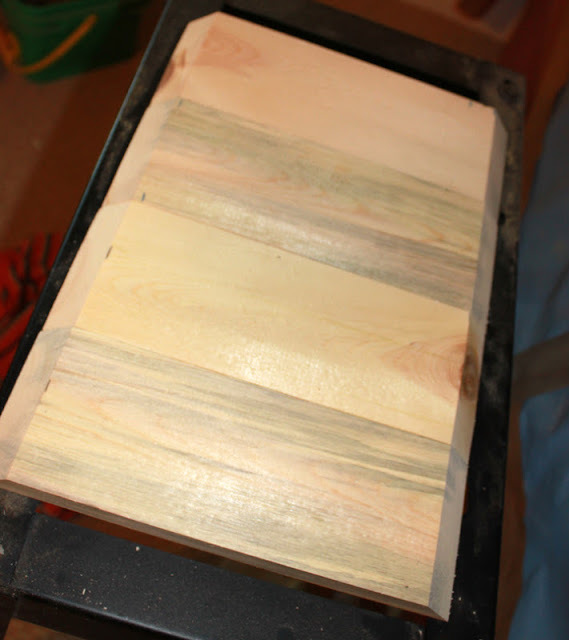 Once I had the sandbox built, I stained the boards with a stain that prevented chemicals from leaching out of the green treated lumber. 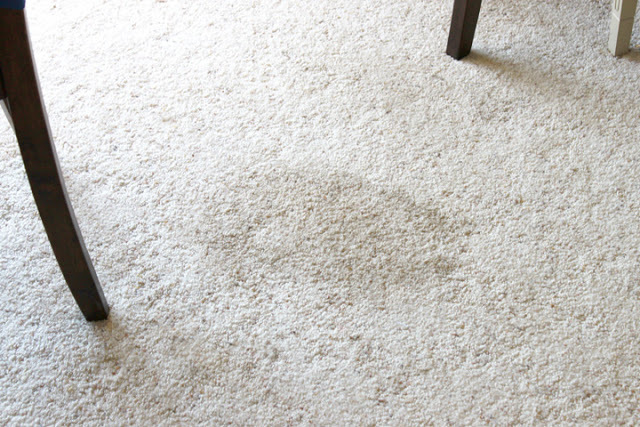 Not all stains do this, so ask your hardware person which brands seal in the chemicals. I also installed some playground toys, a swing, and moved our small playground we had inside the house to the outside. The playground area was complete! 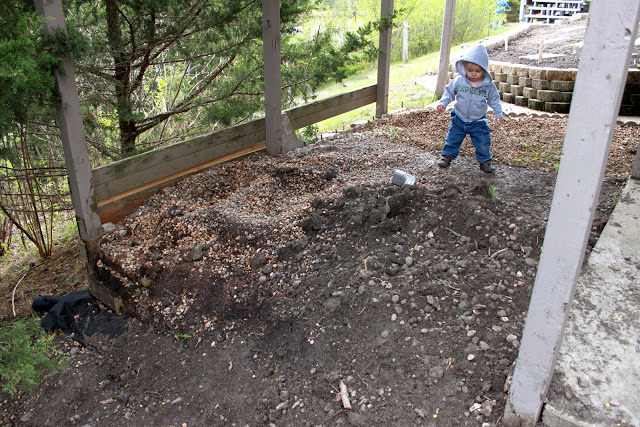 Now he plays in the sandbox every time I am working in the garden, which seems like a lot! You should see my horrible tan lines! On the size with the swing and slide, I had to remove the hostas, remove the rocks, lay new landscape fabric and then put the rocks back. 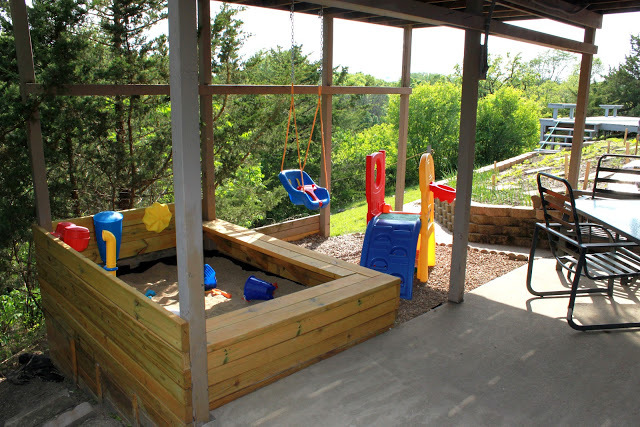 Even though the deck is an eyesore, I really like the playground area. 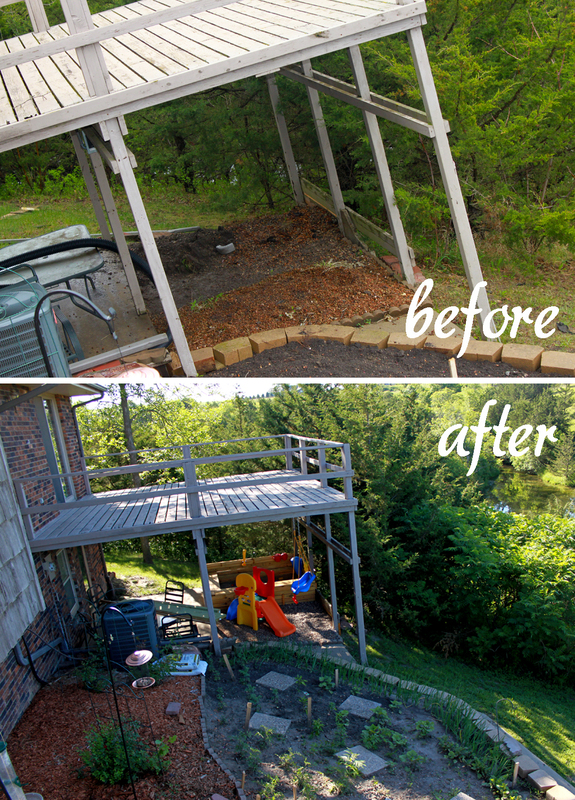 It was a great way for us to use the useless deck as a large shaded area. As I said before, I can be in the garden and Aiden can play in the sand. As you can tell from the picture below, our garden is growing! The only thing that I don’t like is that it seems to be bath night every night now every time Aiden plays in that sandbox! Also, another item checked off my Countdown of Summer Projects is complete!! Thank goodness I found there other bench you see above there at a garage sale last year for cheap or we would have no seating down by the water. 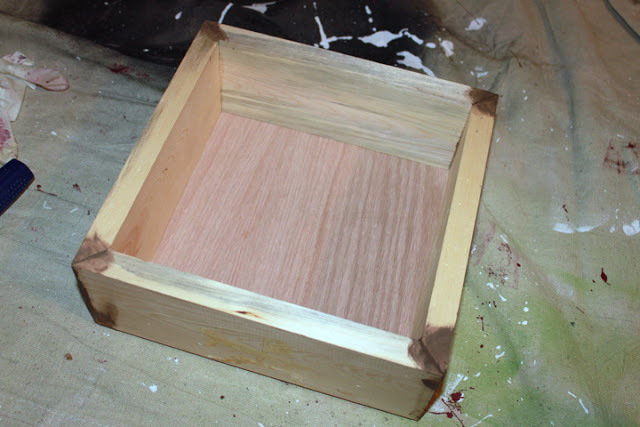 I honestly just plan on rebuilding the same one, just more structurally sound. 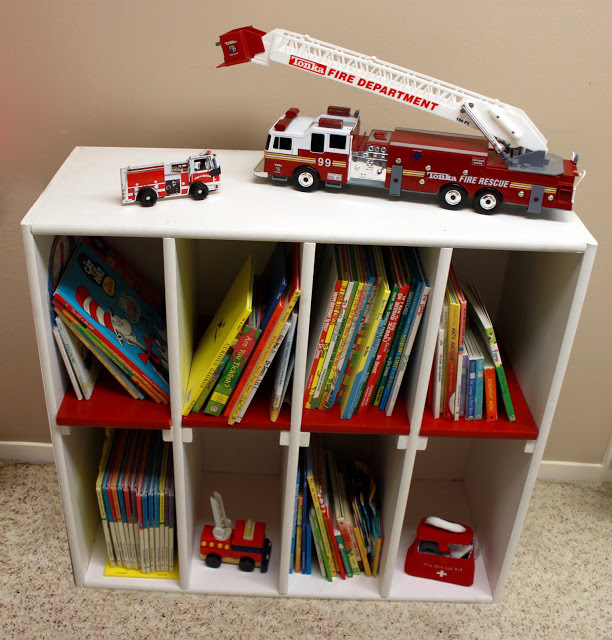 If you have been following our blog, you probably read the post about me creating my son a Fire Truck Room. 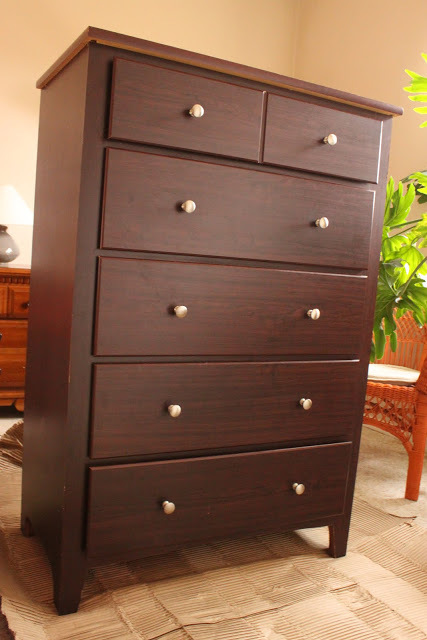 Though the dresser may not look like it is in that bad of shape, it is made out of laminated wood and has scratches all over it. It still has stayed quite sturdy through the years and has managed to survive ten moves in the almost 8 years that I have owned it. My husband hates it and I was quite convinced that I could paint it and put it to good use in our son’s room. After all, kids like to destroy things and I feel a whole lot better if he ended up destroying this dresser over a new one. 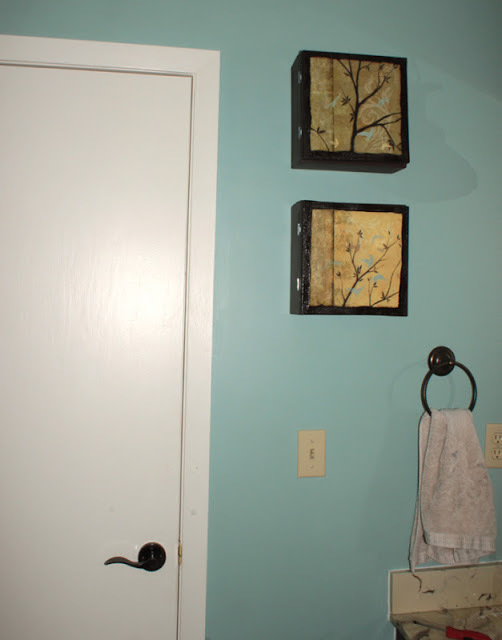 Now, I have always had somewhat of a fear about painting over laminated wood. Some paint just won’t stick to it. 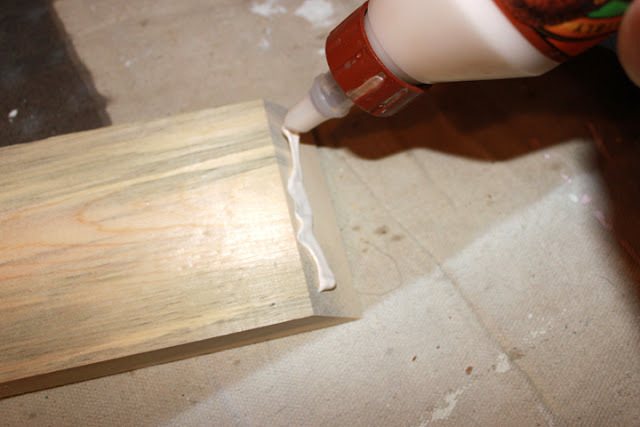 After reading several websites, I found people overwhelmingly endorse Zinsser Cover Stain to paint over laminate. I decided to give it a try. 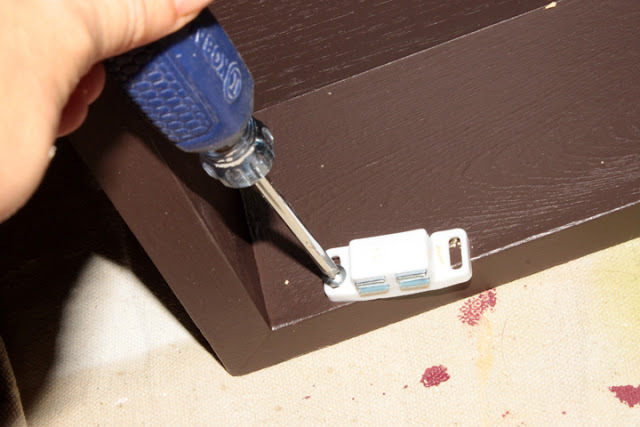 First, when you decide to paint a dresser, you want to start out with removing all knobs and drawers. I tried to remove the top one, but it was stuck. Hubby couldn’t even get it to come out without breaking it, so we gave up on it. 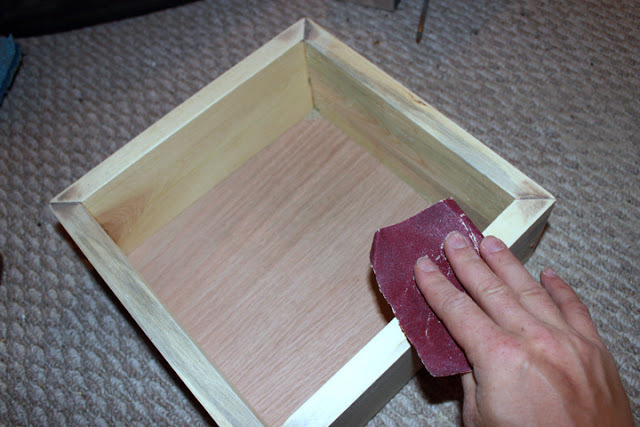 Using a foam roller, I applied the cover stain to the dresser. 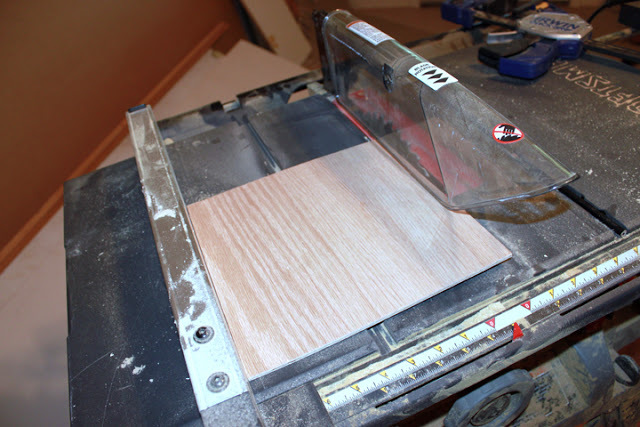 I was very impressed with the way it blocked out the previous laminate color. 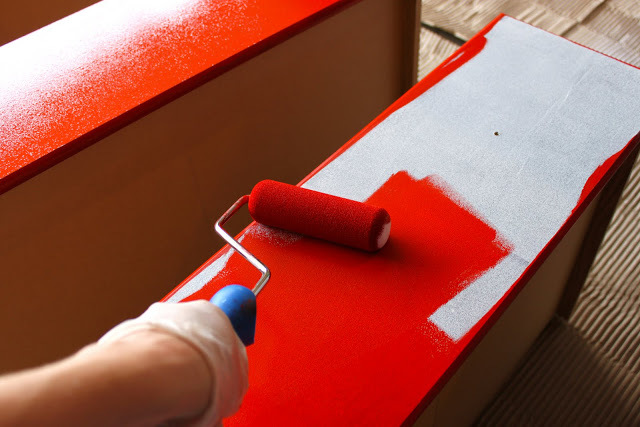 I originally had this grand idea to paint the entire dresser Fire Engine Red. I set out to purchase a gallon of red paint and walked up to the counter at Lowes to have them mix it up. 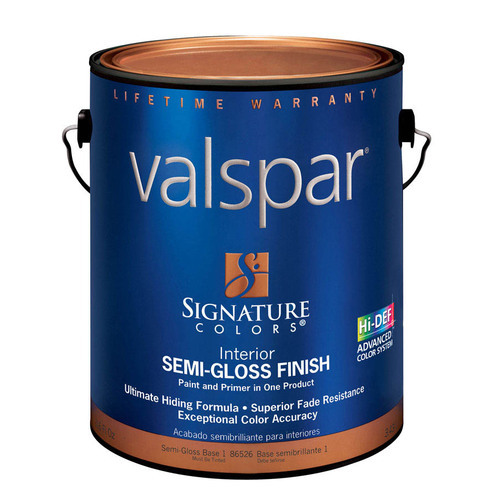 I always like to browse the “Ooops” paint containers for any colors worth buying when lo and behold, they had a Valspar Signature Paint gallon in Fire Engine Red for only $10!! That never happens to me! I quickly yelled to the paint lady to stop with my paint, seconds before she opened the new can, and snatched the “Ooops” gallon up! What a steal, I saved $22 on this paint! 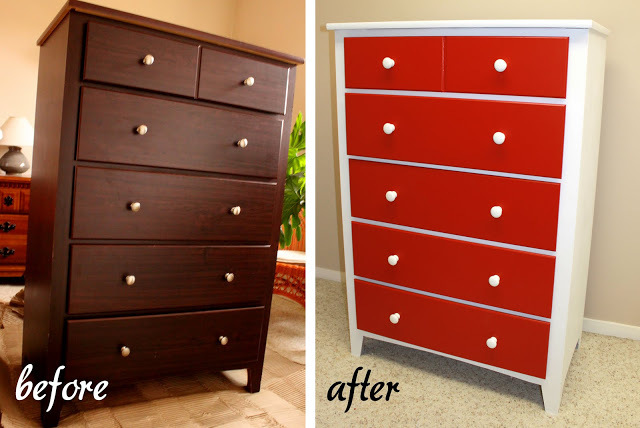 So as I said, the idea was originally to paint the entire dresser red. 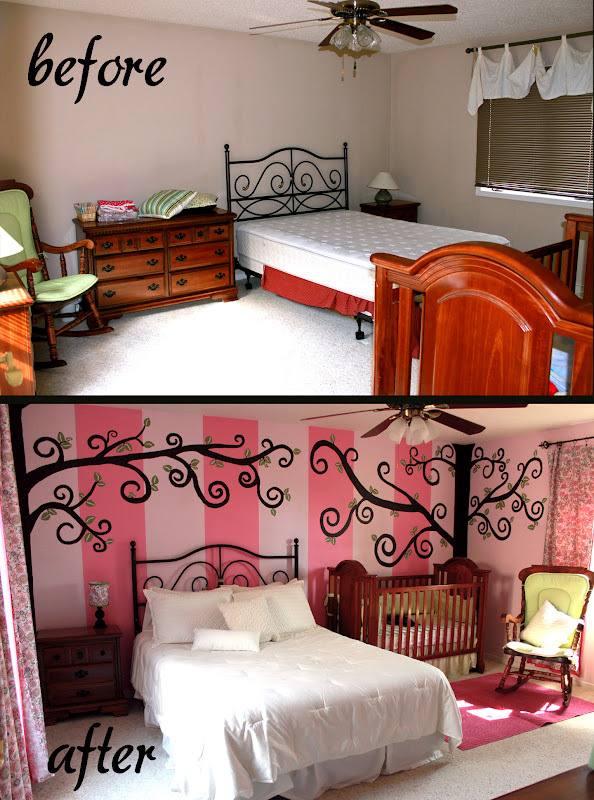 After painting on the side of the dresser, I decided all red was going to be WAY too much for this room! I decided instead to paint the main part of the dresser white. I used some leftover white paint I had from the Adirondack Chairs I painted last summer. 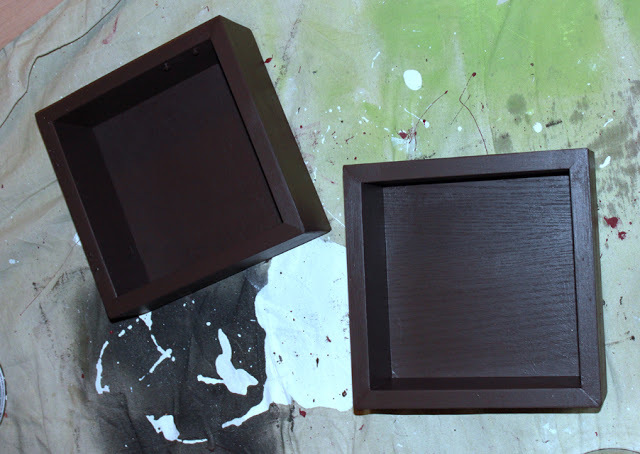 And painted the drawers with the Fire Engine Red paint. While at Lowes I also picked up some white porcelain knobs for the dresser and replace the existing ones. 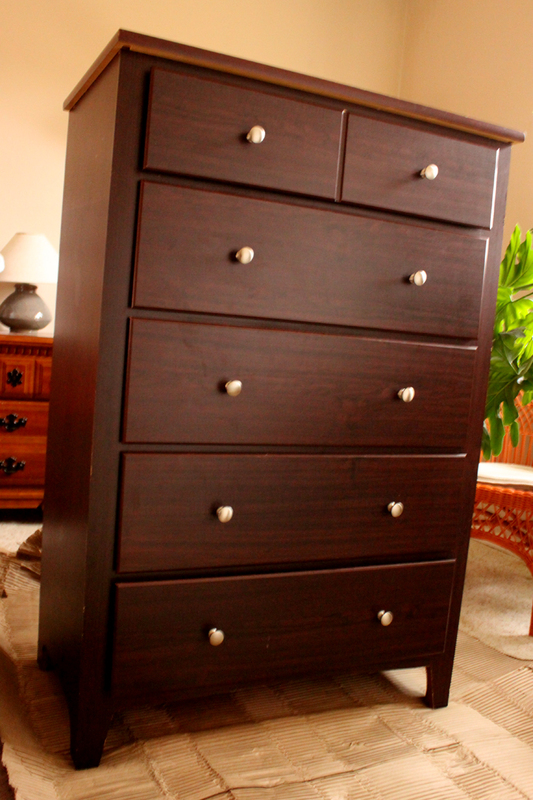 In the end, I ended up with the dresser looking like this and I honestly couldn’t be happier about how it turned out. I love the contrast between the drawers and the dresser. 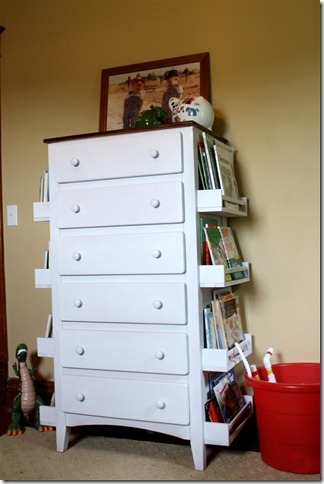 In addition, the white knobs just tie the colors together. 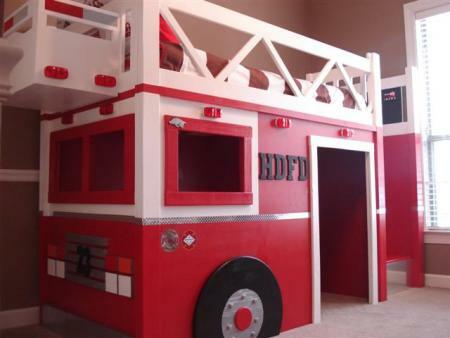 I think this might be final piece of furniture for Aiden’s firetruck room as the room is pretty small and I don’t think I could fit much more in there. I shouldn’t say I am completely done with furniture. 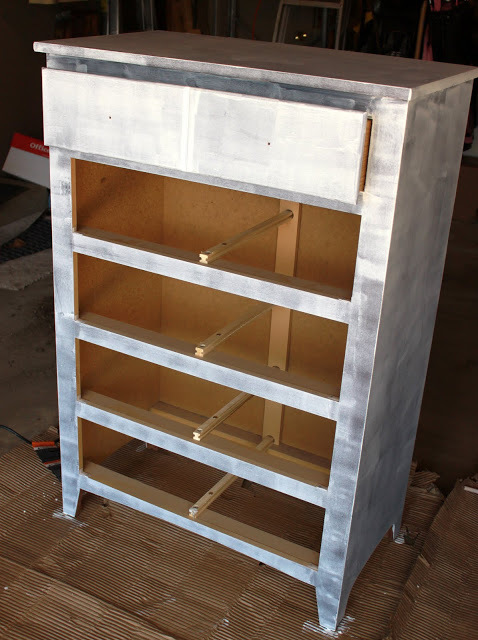 I have grand ideas for a cool nightstand, but I am still on the hunt for the right object to make it work. 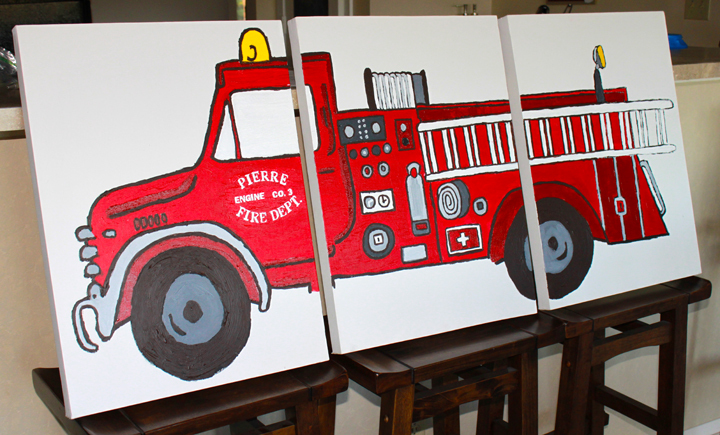 I have said this a few times before on this blog, but I have decided to reveal my grand plans to make my little toddler a fire truck theme room and I thought I would share a few of my ideas with you! First I should explain why a fire truck room– It probably all started almost nine years ago when I met my husband. Not that I was planning out our child’s room, but I saw a picture on his desk of him and his Dad in front of a fire truck. His Dad, my son’s Farfar, was a volunteer firefighter for a number of years. The picture has traveled with us through many moves and has always been on display. 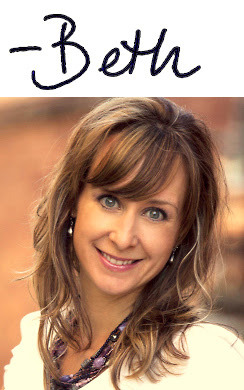 I think because his Dad chose such an important job of saving people, it sent a good message to his family and greatly impacted my husband’s life– as he too chose to go into a profession of saving people. 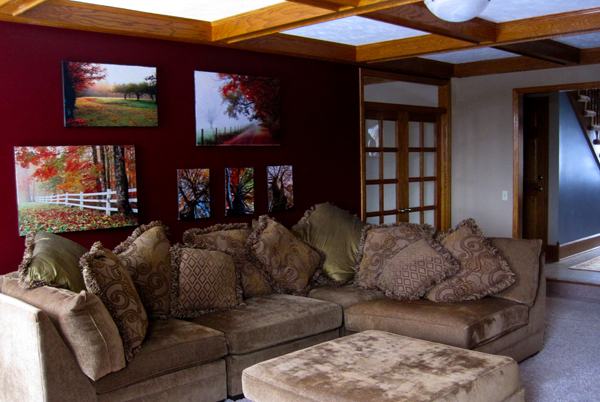 The room is somewhat a tribute to my father-in-law’s former work and my husband’s memory of it. We have several items from Farfar’s days as a fire fighter that will be displayed in the room including his hat, coat, and captains sign that use to hang in the back of their vehicle. Second, it’s just too dang cute! What’s not to love about a little boy in his fire truck room! Plus the resources for ideas for this room are endless. I am obviously not the first person to choose this theme! Third, at some point my son will probably outgrow fire trucks. 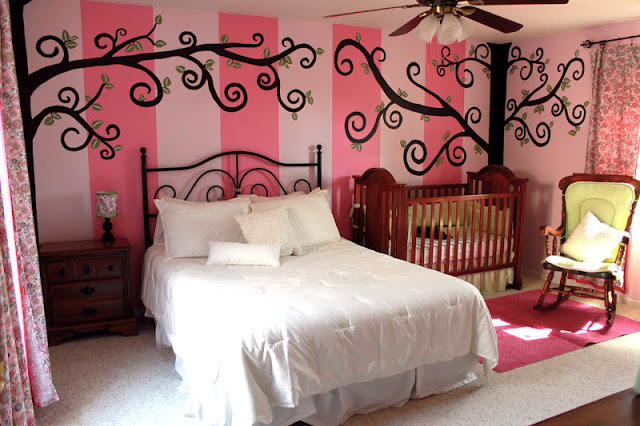 He will probably beg and say ‘that he is not a baby anymore’ and wants a more ‘manly’ room. At this point I hope to suggest to him a room entirely dedicated to my husband’s alma mater University of Nebraska. The red and white furniture can then be reused without an investment in new items. 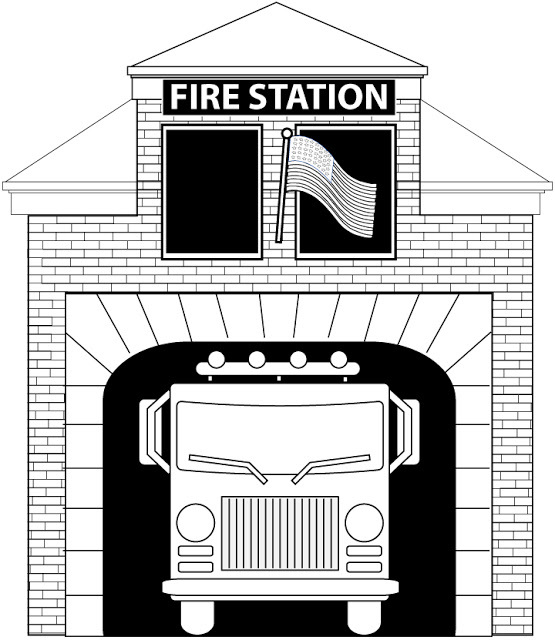 The grand idea to start the room was to build this awesome fire truck loft I saw on Anawhite.com. Though, I decided this won’t work for us quite yet. My son is barely 17 months, and a loft bed with a small kid seems like a bad idea to me. Also, we plan on building a new house in a few years and I have a feeling this thing won’t disassemble and move very easily. 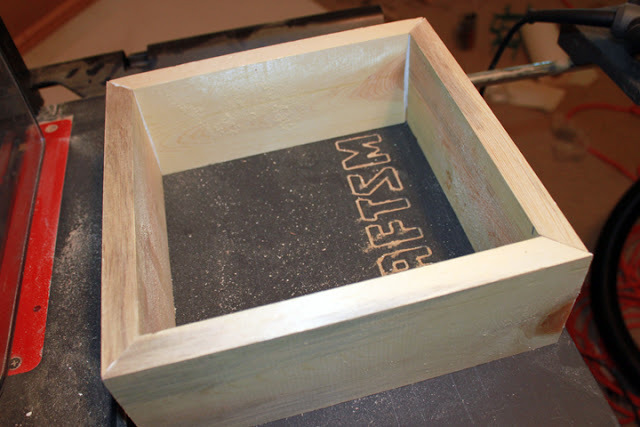 So this awesome little project will have to wait until my son is older and we have our new house. 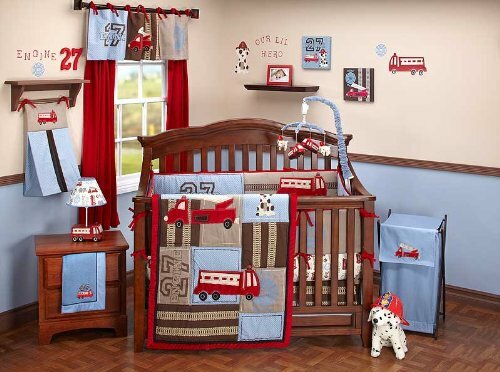 Next, I looked online at these cute little fire truck toddler beds. At a price of $150 and up, I decided just to use the current toddler bed I own until my son outgrows it. 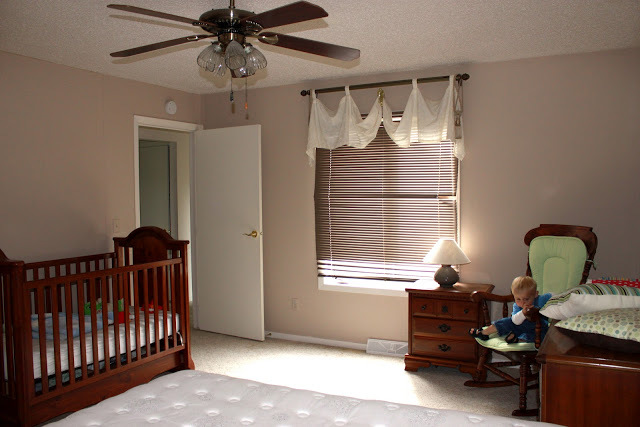 This is our current toddler bed below as it was set up in the nursery in our old house. However, I have painted it white to match the red and white them. And to go with the toddler bed I bought this nursery set. It turns out they don’t have really any cute toddler bed bedding sets for fire trucks. There are a few out there, but I wasn’t a real big fan of any of these. I like the red, white, and brown coloring of this one so I decided to purchase it. The quilt and the bottom sheet fit the toddler bed and I am going to take the crib bumper and refashion it into a nice pillow sham. Ideally, as bedding goes, I would have LOVED to purchase this set from Pottery Barn. 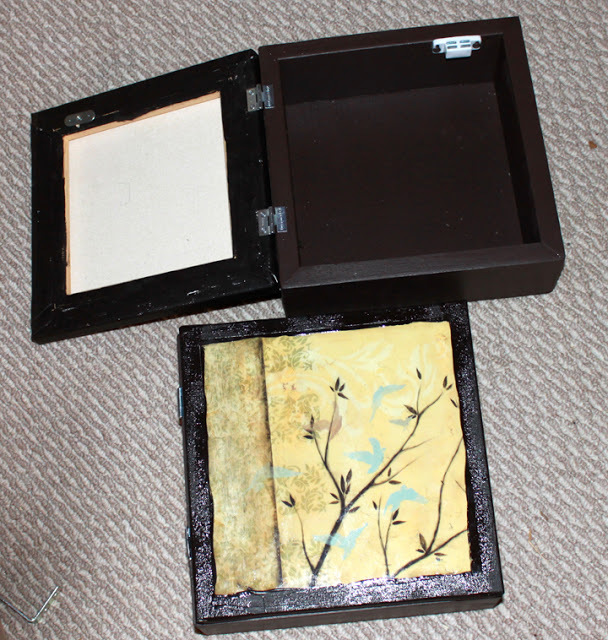 However, Pottery Barn discontinued it and the ones on ebay are used and $300. No thank you! I also LOVED the painting in the picture above. I decided to create my own copy of it. With about 2 weeks of painting in my down time, I finished my own version of a painting that to him will be a mommy original. I also like the idea of turning one wall into a fire station mural. The one below is wallpaper you can purchase, but I hate wallpaper so I plan to paint my own. 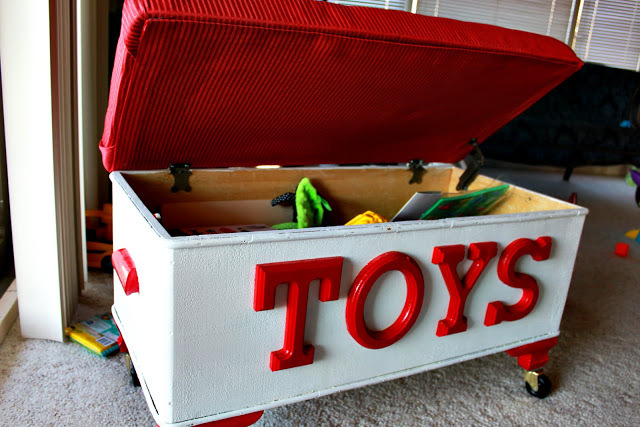 the toy box (Garage Sale Redo: The Toy Box). 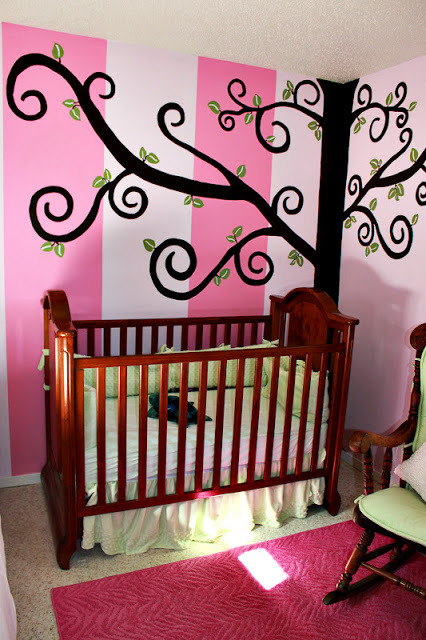 Anyways, I hope to get the room entirely finished by May 11th– the day we find out if we are having a girl or a boy with this next one. 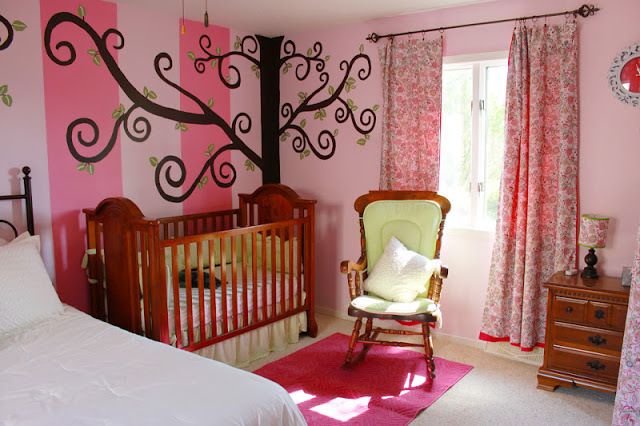 Once we find that out, I will be planning the grand decor for the nursery! 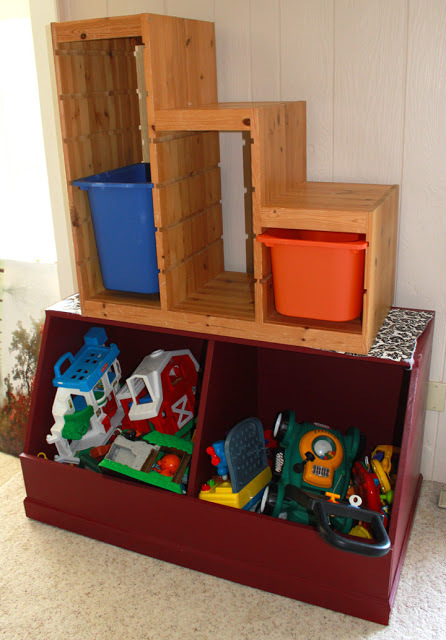 A few weeks ago, I wrote about my garage sale toy box transformation. 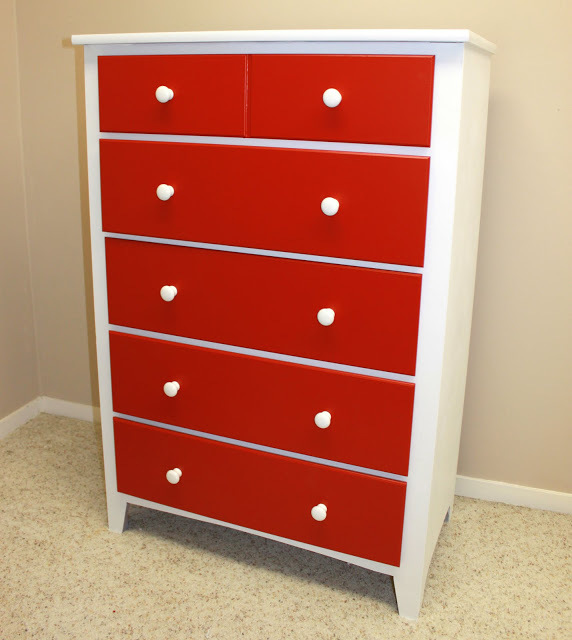 I am on a quest to turn my son’s room into a firetruck theme room eventually, so I have been finding random furniture and painting them red and white to match the theme. 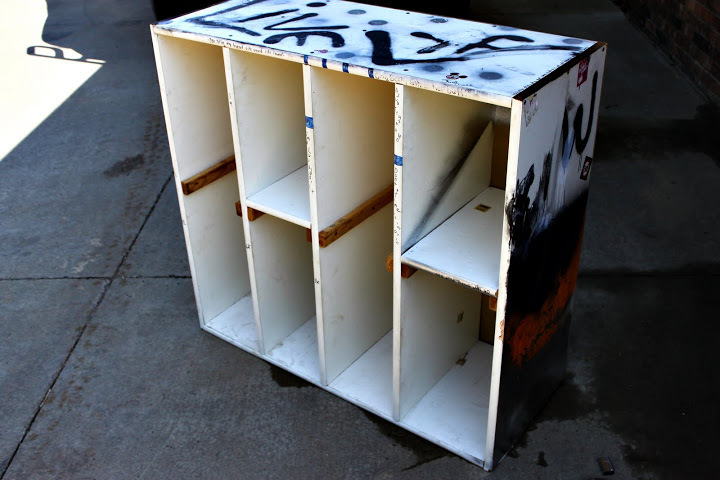 At the same garage sale that I bought the toy box, I found this awesome, homemade bookshelf. This thing is HEAVY and sturdy and it was only $3!! The only problem was the previous owner obviously was some teenage girl with angst and she decided to take it out on this bookshelf. Don’t get me wrong, I love a teenage girl with angst…who doesn’t? I would rather she take it out on this bookshelf rather then her parents. It reminds me of myself at her age, a little, as I destroyed several pieces of furniture with paint in my day. (Ask Luci, she was horrified about me painting all over an antique phone bench.) 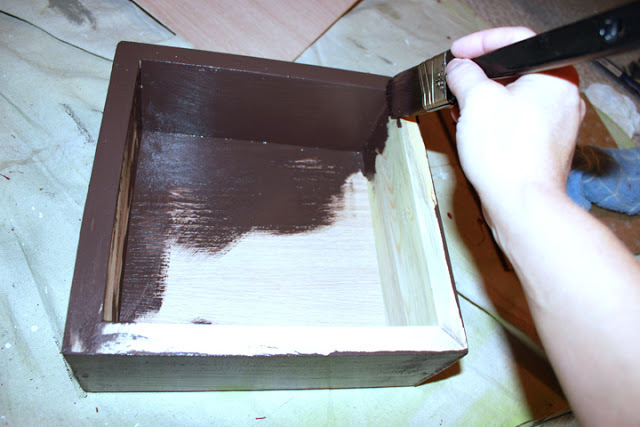 However I used acrylic paint, which is easy to remove, not spray paint like this girl. I thought you had to be 18 to buy spray paint? I do have to admire her use of keys glued to the bookshelf, as I think if she covered the whole thing in keys it would turn out pretty cool looking. The one thing I can’t figure out is when this girl was a teenager. Below you see lyrics from the song Right Round by Flo Rida (2009). But then on this side she has lyrics from Sir Mix-a-lot’s Baby Got Back (1988). Also, there are lyrics to Absolutely (Story of a Girl) by Nine Days (2000). I am just super confused when this girl was a teenager. Her music selection spans 20 years! Anyways, whatever this girl’s story, I had some left over paint from the toy box and decided to use it to redo this bookshelf for Aiden’s room. 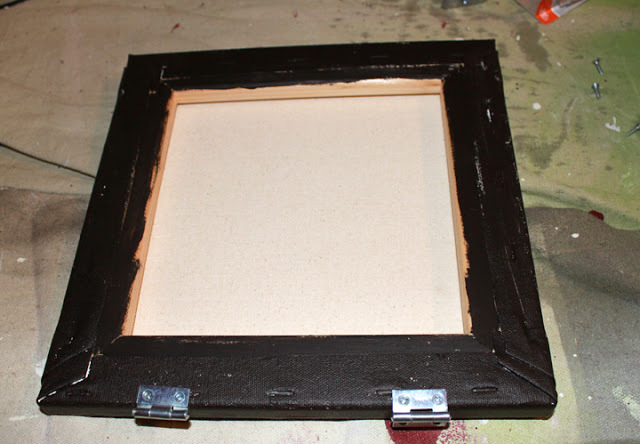 It took about 8 coats of white paint to cover up all the black spray paint. As you can tell from above, it took soooo long to paint over the scribbles that I spent a lot of the time thinking about the girl who did caused me all this trouble. 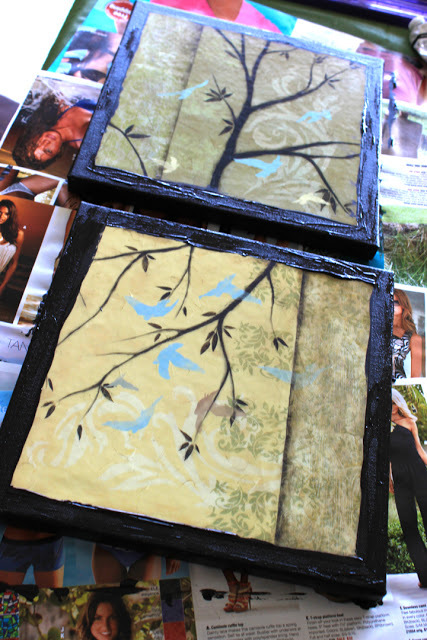 Though it was time consuming, the results were great! I really like the red shelves. The bookshelf is at a perfect height for my son to get to all of his books. And promptly remove them from the shelf as fast as he can so Mommy has to pick them up. He does this often! I am really happy with the results of the bookshelf and it’s really amazing what you can do with just a little bit of paint. A few weeks ago, I wrote a post about Organizing The Garage for the Fall. It’s the perfect time of year to do it. 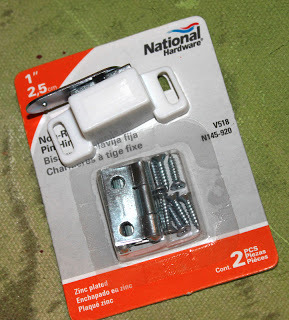 As I said before, I can’t imagine spending the winter hunting for that screw driver or drill bit in below zero weather in the mess of a place we had, so I decided to organize it…well as much as I could. Here is the before right side of the garage is full of yard equipment, fireworks (gotta love SD), random auction purchases, and other junk. On the far right side, I made a sort of biking station. I like things off the ground so that I can sweep the garage easier. Under the shelves, I secured some nails and hung up all the power yard tools. Next to the biking station is all of the yard tools. I know, it doesn’t look the prettiest, but they are all up there and have a spot. I used just nails to hang them on the wall. It’s cheap and easy! I made a golfing area over to the left, a basket storage area in the middle, and a power tool station to the right. I love baskets! They look nice and hide miscellaneous junk! 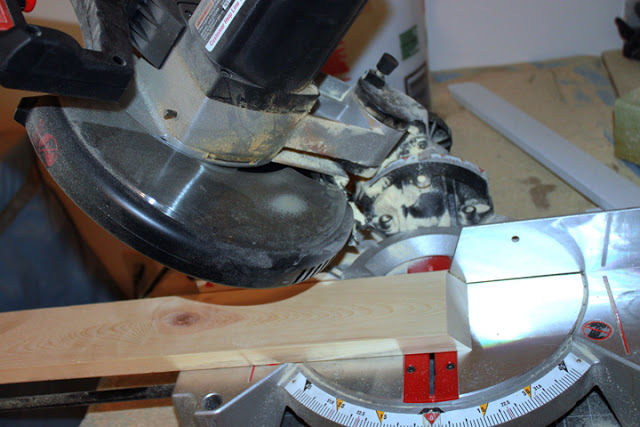 This is the power tool station. This was the left side of the garage, which was littered with shoes, golfing stuff, screws, nails, multiple strollers, fishing gear, paint, and several ladders. 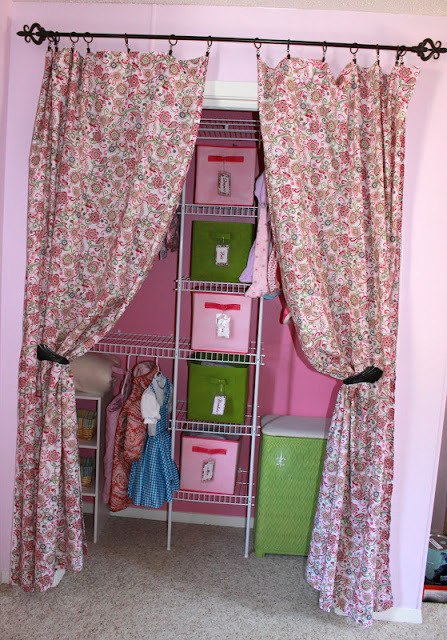 Starting from the right side, I made a ladder station and covered up the existing cupboard with a curtain to hide some of the mess. In the cupboard I put baskets to hold our work gloves, rags, and one for misc items. Also, I have a stacked storage bin that I call my safety station. It has earplugs, eye protection, and face masks. I found a very cleaver idea to label a container of bird seed (thanks to Pinterest). 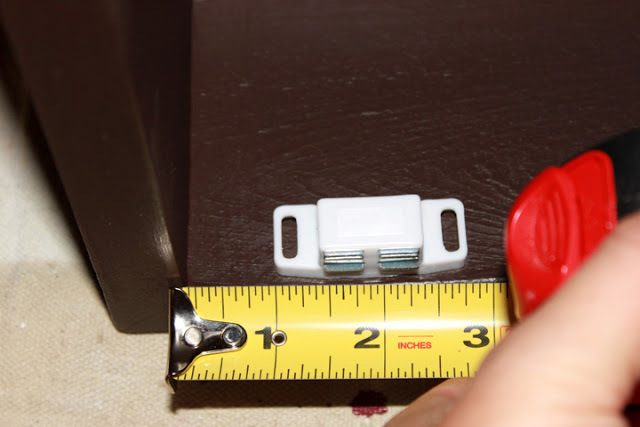 Also, the tight seal lid is great for keeping mice out of it…which I have already seen one in our garage! I love my pegboards. They were easy to make and hold so many things! I bought some heavy duty hooks and this peg board also acts as a coat & hat rack. I picked up this storage shelf at a garage sale. I am using it as a shoe bench though. 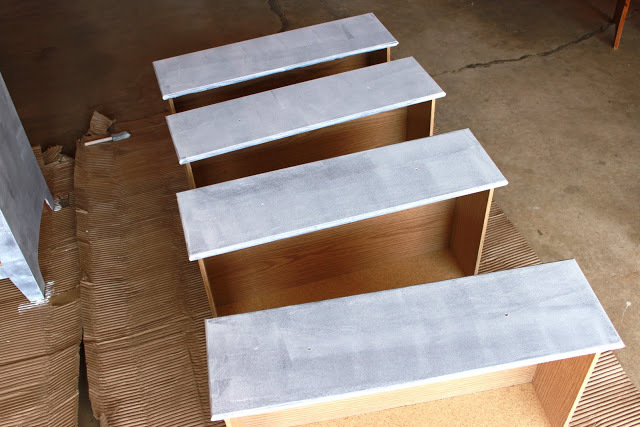 It is heavy duty enough to hold the weight of a person sitting on it to take off their shoes. Moving over to the left, I purchased a metal toolbox I from K-Mart that was clearance down to just $99. 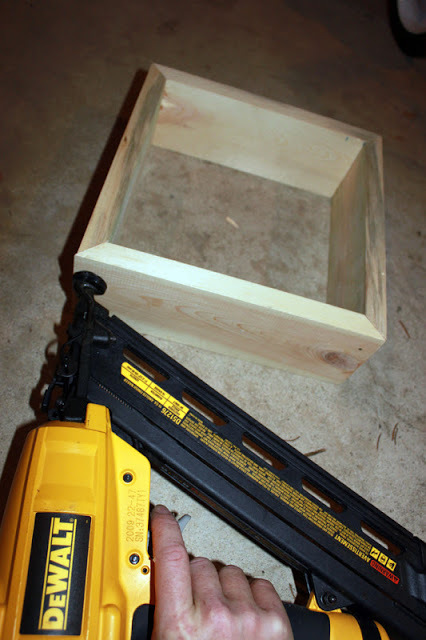 Fall is the best time to buy a nice, heavy duty tool box. 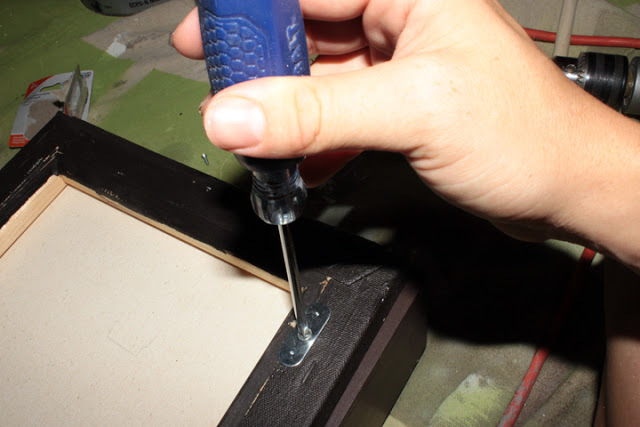 If you have a lot of nails in boxes, just leave them in there. 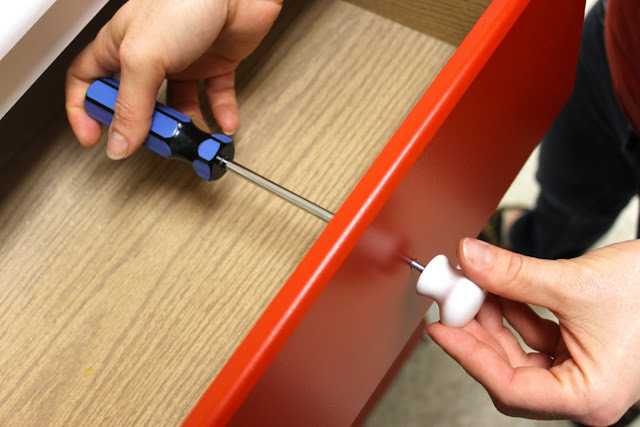 Having the easy to read labels view-able makes it fast to pick out the right screw or nail you need. Below the nails and screws is the stroller station. As I said before, I tried to put as many things off the ground as possible to make sweeping easier. The far left is the painting and fishing corner. 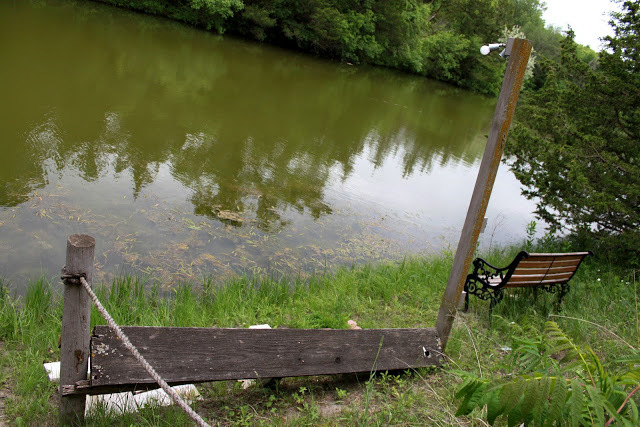 We live on a pond so the fishing equipment is a must. I installed some remaining pegboard so I could hang all the random fishing items we own. 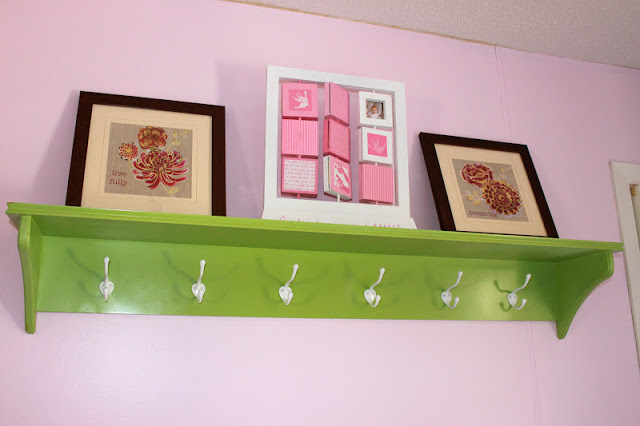 The paint cupboard was a mess, but I organized it and added in some cupboard door shelves. Stacking the paint cans in a pyramid shape allowed it easy to see each spray paint can color. Also, I LOVE keeping old coffee plastic containers. 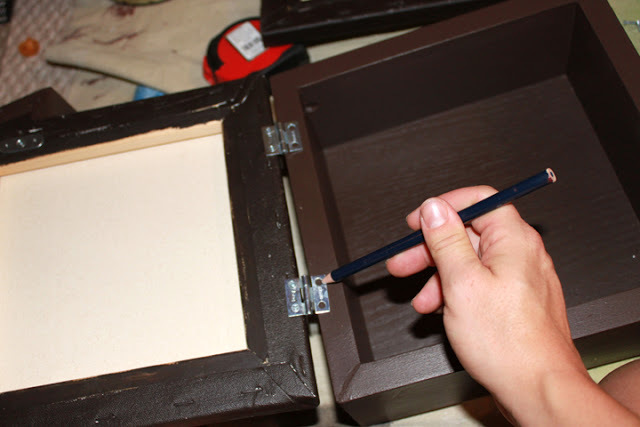 I used them to store my brushes in and while painting I like to used them to hold the paint for cutting in. One thing I will need to change pretty quickly is the spray paint cans. I am pretty sure the garage will get too cold to store them outside, so I will be moving them into the basement storage room soon. Well, that’s my somewhat organized garage. I hope you got a few ideas from the place. As I said, I would love to have a picture perfect garage, but I just don’t think it was stay clean very long with us. I like to organize the garage into “stations” so that you can easily find items and put them back in the correct place. 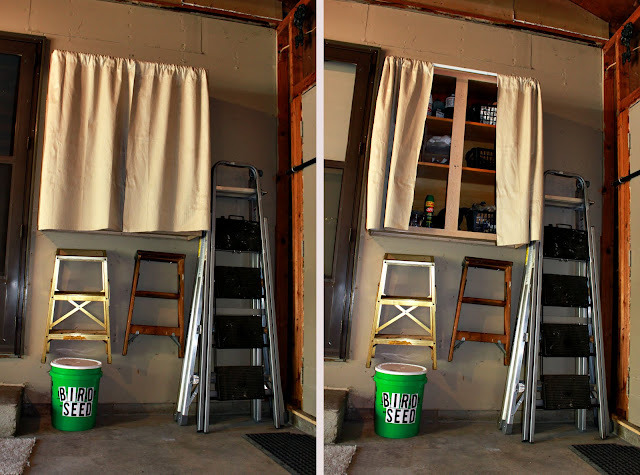 Have you organized your garage this fall?? If so, I would love to see your ideas! Just comment with a link below! 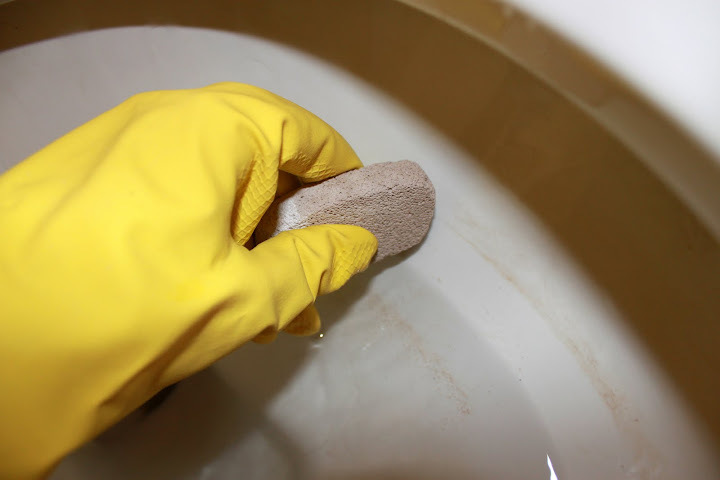 Cleaning Hard Water Toilet Rings without Chemicals! When we first moved into our new house, we had toilet rings in ALL of the toilets. The house was on the market for 2 years and completely empty, so no one took care of cleaning and flushing the toilets. With the hard rural water we have, we ended up with really bad toilet rings in all the toilets. After multiple types of chemicals and scrubbing to no end, I still could not get remove the hard water ring. I was complaining to my Mom about it one day, and she suggested a pumice stone. You can use an old one you have had around the house (don’t use it on your feet after the toilet) or go buy a new one from Walmart for $0.80. Just don your rubber gloves and lightly rub on the ring with the pumice stone. 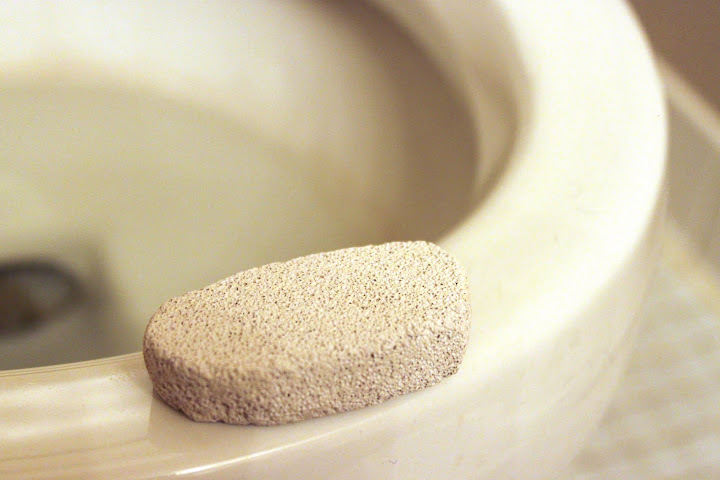 Don’t rub too hard, because you could scratch your toilet. It’s amazing and the ring will vanish before you eyes! 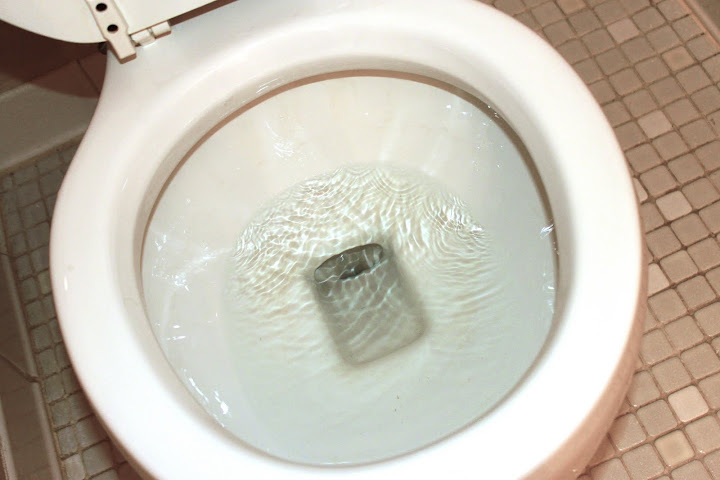 No chemicals, no smells, no mess….just a nice clean toilet with no hard water ring!